This is my cat. His name is Scratch. He got the name from my kids when he was a kitten, because he scratched anyone who tried to pet him. He doesn’t do that anymore, but as you can see, he still has claws and uses them to hunt game. Subtracting all the ones we didn’t see, he’s delivered five cute baby rabbits to our front porch this summer, killed them slowly like an interrogator, over the course of two to three hours, and devoured them, leaving nothing but the paws. It can be embarrassing having this death scene on the front porch. 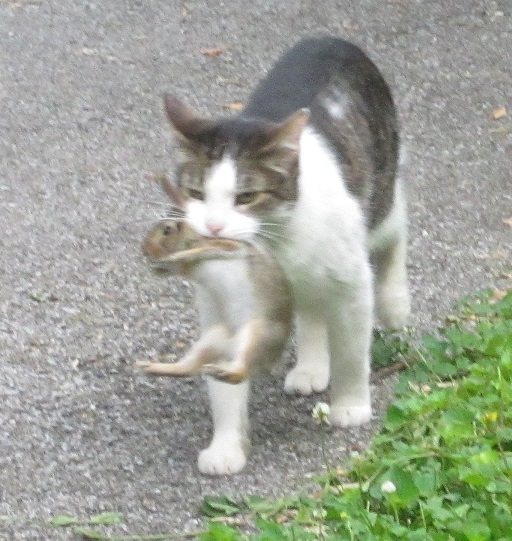 One afternoon when my son’s girlfriend was visiting, Scratch snuck in the front door behind them and dropped a screeching bunny on the floor. Between the two of them, my son and his girlfriend caught the poor thing in a bucket and put it outside. It was already mortally wounded so Scratch still ended up eating it, right there in front of the door. We’d love it if he had his “meals” elsewhere, but there’s something in his nature that makes him bring them home. If only the bunnies didn’t cry so hard. The first time he had one by the neck, I freaked and made him drop it. I held him until the shell-shocked bunny escaped. It was a gut reaction to save a defenseless creature, but later, as my cat moped near the front door, I got to thinking about being a cat. He was just doing what cats need to do. He catches the bunnies fair and square – and he eats them. It isn’t right, I thought, to deny him his right to be a cat. He never considers if what he’s doing is acceptable to us; he does what he’s pulled to do. He takes care of his own needs. I know we aren’t as base as animals, but I find it interesting that humans don’t recognize their needs and best interests nearly as well as, say, a cat. Instead, most people deny their needs for fear of being rejected. We pretend our needs don’t matter or can “wait.” Why do we feel like our needs are not important, or maybe even unacceptable? If we were proud of taking care of ourselves (like my cat, Scratch, who isn’t ashamed of feeding himself), who would be offended? But we secretly deny ourselves in so many ways – healthy food, adequate money, ample love, nice housing, respect, safety, support, etc. Regardless of the form, denial is a symptom of our feelings of unworthiness. Denial is our way of saying, I am not as good as other people, and consequently don’t warrant care on an equal level. What does it look like when we are living “in denial”? We might not even be fully aware that we’re denying ourselves the things we really need. Often times, just our thinking prevents us from having a full and prosperous life. We deny ourselves when we think we aren’t smart enough, when we think we aren’t attractive enough, when we think we don’t have enough money, or feel unloved. If we’re embarrassed about our needs or don’t accept who we really are, we try to hide that by covering up, pretending things don’t matter, or that we can “get by” without. We “condition” ourselves to hide behind a false self that we believe is more socially acceptable. We might wear certain clothes to try to make ourselves feel and look more attractive because we secretly feel ugly. We might force ourselves to do more physically and emotionally than we really want to in order to prove we are capable and strong because we secretly believe we are weak. We deny who we are and how we feel by pretending. Everyone does it to some extent, because most of us are confused about what it means to feel whole, to accept our entire being, needs and all. We all have needs, but what happens when we perceive our needs as deficits, things we are lacking rather than just normal things that everyone has? Often, experiencing our unmet needs triggers our feelings of vulnerability, scarceness and consequently unworthiness. To have our needs met, we might need others’ help; we might have to ask, and these can be scary propositions. I grew up one of five children living in a divorced household. My mother always complained about the size of the support check my father mailed monthly – it was “never enough.” That was the story we grew up with, but it wasn’t the truth of our situation. We always had enough food and lived in a relatively nice house in nice neighborhoods. However, that one comment repeated over and over again, coupled with her opinions about how little he cared about supporting us, translated into some pretty corrupt thinking about feeling supported or feeling worthy of support. As a result, I went for years making so little money, I couldn’t save anything. As a single mother myself, I worked, but never had a job that paid enough to build upon. We barely got by. In fact, I’d built up a sense of pride in my ability to “make ends meet” despite my poor income. The most embarrassing part of all is that, I had a master’s degree! Why was I denying myself an adequate income? I had a lot of excuses about why I “couldn’t” get a better job, but the real truth is I didn’t feel worthy of support, not even my own! We were teetering on the brink of collapse and I wasn’t willing to reach out for help. Sadly, I wasn’t even conscious of what I was doing, or why. Thank God for second, and third, even fourth chances. The good thing about beliefs is, they almost never last forever. Another equally strong belief can change the way you think about your life and affect your circumstances. One year, as the Christmas season approached, it happened to me. I realized I couldn’t afford to buy anything for my kids. I couldn’t even charge anything because my debt load had breached the $5,000 mark; a number that was, (for whatever reason) my limit. I saw myself falling deeper into debt with each passing year and the embarrassment of that reality shocked me into a dark anger. My financial future looked so F-ing bleak! Internally, I raged against my situation. I wasn’t thinking “why me,” I was thinking “hell no, not me!” More debt was out of the question. I wasn’t going to stand for it anymore. Getting pissed off was the perfect antidote for denial. My resolve to find something better was ignited and the anger sustained me for the six months it took me to find a job that paid enough to cover the bills, to start chipping away at the debt I’d made and to put some money away as savings. I had been denying my need to take care of myself on a very basic level. I was denying my ability to create abundance and my need for some small sense of security. I believed these things were a sign of weakness. I thought, if I just got tougher, then I would keep getting by. Instead, I got angry and it was the best anger I ever experienced. We all need to be better at recognizing when we are denying our needs and pretending everything is okay. Take a close look at the areas of your life where you seem to be struggling. For me, it was money. What one thing could you give yourself to make things better? Permission? Freedom? Acceptance? Love? Taking care of yourself first is one of the greatest goals anyone can have in life because taking care of yourself gives you the ability to take care of other people. It is easier to recognize and honor others’ needs when you’re giving to yourself first. Self-denial isn’t a noble trait. In fact, self-denial is like a living suicide. You’re alive, but you’re killing your soul. Luckily, souls are hardier than you’d like to think. Like cats, they have a lot of lives to spare. How many? I’d like to think thousands rather than 9! So what will you do with what’s left?